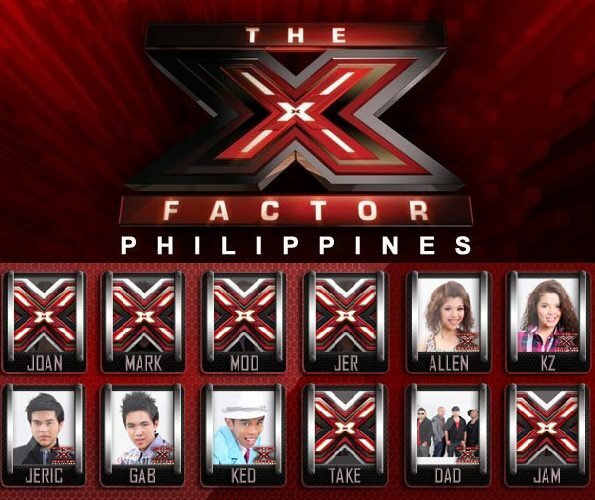 It’s week 7 of the X Factor Philippines live performance with only 6 contestants remaining. That means we are just a few more weeks away from finding out who is the first ever grand winner for the X Factor Philippines season 1. But before that, as usual, we await the performances. But before everyone started performing, an opening number from the L.A. Dancers kicked off tonight’s show. Afterwards, it’s on with the anticipated performances of the night after the break. Four Rivermaya songs were chosen and only two for Eraserheads with the first four performances all choosing Rivermaya tracks and the last two opting for Eraserheads. I’d say everyone got a suitable song tonight. Another noticeable point is that only Martin Nievera’s team remains complete with all three boys Jeric, Gabriel, and yes, even Kedebon still in the show. Two girls, KZ and Allen remain for Charice Pempengco and the girls while Gary V. has only one act left, Daddy’s Home, for the groups. Ms. Pilita Corales no longer has any representatives left for the over 25 with Joan Da eliminated last week through a judge’s decision with all three judges except Ms. Pilita voting her out. As for the X Factor Philippines live performance tonight, Daddy’s Home is consistent with their melodic rhymes and blending. Gabriel used his falsetto voice weapon again which started with his week 5 performance of Rainbow by South Border. Ms. Pilita calls him the dark horse of the competition, which may as well become true. Sometimes the unusual suspects win. Jeric on the other hand had the appropriate voice for his song. It’s just the right easy type of rock. As always, KZ rocked the house. Her version is something no one has ever heard before. She’s definitely just unique and is a force to reckon with. It’s no wonder that her fellow contenders think of her as a threat. Another potential threat is Kedebon and his lively personality and performances. No one can deny the enormous following he shares, just over the web alone. Well, these include both bashers and fans anyway. Allen, who was in the bottom two last week is the last to perform tonight. Her version sounded more of a Regine Velasquez theme than of Eraserheads. But let’s find out who goes home tomorrow night. I’m seeing a trend that whoever has already landed on the bottom two at least once is more likely to be eliminated the next time the same act is found lacking again in terms of votes. So will Allen be on the bottom two again? Who will be the other contender who will be in danger of being sent home? These will be answered tomorrow night. For now, that’s it for the X Factor Philippines live performance week 7.